We would like to introduce Jackie Harney, one of our Customer Support Representatives. Jackie brings over 15 years experience in roles providing technical support, business analysis, and project implementation to Morse Data. Jackie graduated from Illinois State University with a degree in computer science, and takes continuing education classes because she loves learning new things. In her free time, she enjoys landscaping, woodworking, volunteering, painting, and knitting, but her favorite pastime is spending time with her daughters whenever they are in town. Morse Data Corporation is an integrated partner of Endicia. By integrating Endicia with InOrder, Morse Data clients now have access to Endicia’s certified U.S. Postal Service solutions. Whether you are a high-volume warehouse shipper, operating an e-commerce site from a garage, or simply trying to get invoices out before the day is over, Endicia can help save time, reduce costs, and increase productivity. Endicia is the leading provider of e-commerce shipping technologies and services. Endicia delivers value by creating breakthrough shipping solutions that help global businesses, small and large, run their operations more smoothly and function more successfully. Endicia also offers seamless access to USPS® shipping services through integrations with more than 200 e-commerce partner applications. A trusted partner of the U.S. Postal Service® since 1987, Endicia has printed more than $10B in postage. InOrder customers can use this link to sign up for a free trial. USA Fulfillment is updating its legacy system with InOrder ERP software to support its order management and warehouse management activities. 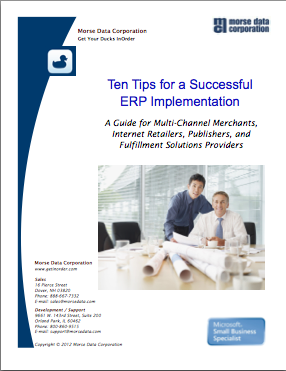 The selection process, which took over a year, included interviews and demos of 8 ERP systems. InOrder was selected for its superior order management, warehouse management, RF, lot control, and replenishment capabilities. In addition, InOrder meets USA Fulfillment’s requirements for PA-DSS (Payment Application Data Security Standard) compliant software. With the InOrder ERP eCommerce Order and Inventory Management software, USA Fulfillment will have real-time access to availability of stock and ship dates, and call center reps will have access to the same real-time inventory information. In business since 1983, and based in Chestertown, MD, USA Fulfillment provides eCommerce services, warehousing, shipping, order filling, and 24/7 call center for eCommerce businesses. For more information, visit http://www.usafill.com. How Fast Can Customers Find Your Products? When shoppers search for a specific product on your website, how quickly can they find it? If shoppers search for something specific, it means they know what they want, and they want to find it immediately. Shoppers spend just seconds deciding whether to make a purchase. If they cannot quickly zero in on what they are looking for on your website, you may as well not sell it. Online shoppers often have a good idea what they’re looking for when they get started. You accommodate this by organizing your website to help shoppers find products easier and faster. But how can you get your products in front of shoppers fast enough? Setting up your products to match how shoppers are searching for them and using top of the line search capabilities, such as Solr Search and Facet Filtering, will improve the speed of finding products in search results. Check your search analytics (InOrder reports, Google Analytics, etc.) to see how users are searching your products. What do your shoppers search for and what are the results? Determine which attributes are searched most often, commonly misspelled terms, and how results are being filtered. If necessary, use InOrder’s superb flexibility for any modifications by setting up products to match how users are searching for them. When setting up filters, place more important filters on top. Facet Filtering help customers fine tune their search results. It enables shoppers to make additional selections within search results based on their individual interests, eliminating the need to sift through too many results. This feature is most beneficial when there are thousands of items in inventory. Shoppers expect this capability, and it provides a lot of power for minimal set up. Shoppers will find what they are looking for. Why not make sure they find it on your web store?